Dry skin can be incredibly frustrating–not to mention, extremely stubborn. Especially at this time of year, many of us suffer from the itchiness, discoloration, dullness, and skin flaking that accompany dry skin. If you’re a dry skin sufferer, though, you may be trying to tackle the problem the wrong way, and actually exacerbating this skin condition instead of alleviating it. In this post, we’ll discuss some of the best approaches to taking care of dry skin, and mention some of our favorite dry skin treatments. When your skin becomes flaky and chapped as a result of dryness, it can be tempting to reach for an exfoliating scrub and buff away the dead skin. However, it’s especially important to be gentle when it comes to dry skin. The grains of exfoliating scrubs can cause irritation to your already delicate skin, causing tiny tears in its surface, and promoting the vicious cycle of dryness. We recommend exfoliating no more than three times per week, and preferably with a gentle konjac sponge rather than a mechanical scrub. Follow up with your favorite hydrating serum and a humectant moisturizer. Certain ingredients in your everyday cleanser and toner could be contributing to your dry skin issue. One of the biggest culprits of this is denatured alcohol–which can appear on an ingredients list as ethnol, isopropyl alcohol, alcohol denat, methanol, and benzyl alcohol. These harmful alcohols erode your skin’s protective lipid barrier over time, making it prone to dryness and inflammation. Worse yet, they can seriously mess with your skin’s ability to regenerate itself at the cellular level, at least when used over long periods of time. 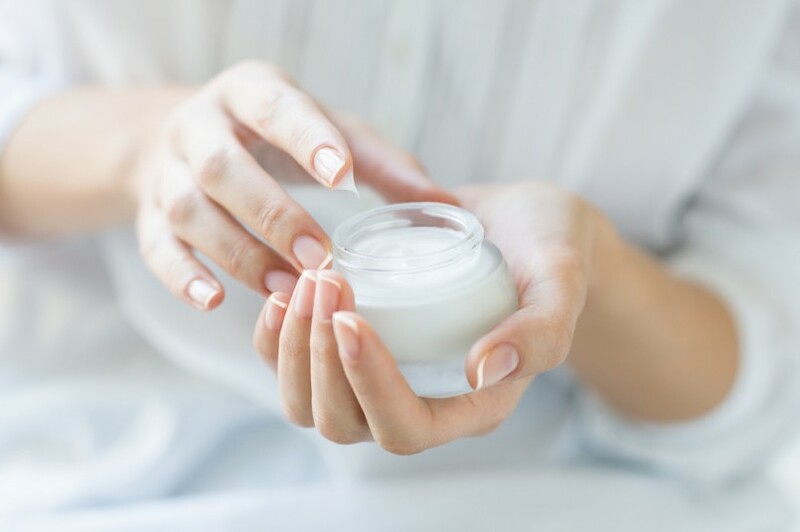 Believe it or not, there’s a difference between “hydration” and “moisturization.” Hydration refers to the actual saturation of your skin with water, while moisturization means supporting your skin’s natural lipid barrier with healthy fats that will lock in hydration. It’s important to both hydrate and moisturize dry skin. For the first step (hydration), we recommend a deeply hydrating, vitamin- and mineral-rich toner like 100% Pure’s Restorative Sea Culture Hydrating Toner. Next, you’ll want to seal in all of that hydration and help restore your skin’s barrier with a powerful moisturizer. One of our favorites is Morning Song Gardens’ Bee Balm Cream, a deeply nourishing formula that works perfectly as a nighttime treatment. There are plenty of natural, DIY beauty ingredients out there that can make an enormous difference for dry skin. Raw butters, pure carrier oils, and honey can all help to moisturize dry skin. These ingredients contain healthy, fatty acids, which replenish the skin’s lipid barrier, helping it to retain moisture throughout the day. Try experimenting with cocoa butter, shea butter, sweet almond oil, castor oil, jojoba oil, and honey–or making the DIY hydrating mask below! This intensely hydrating mask will suffuse your skin with moisture. It’s perfect as a before-bed treatment. To make a DIY face mask for dry skin, first, mash up a thumb-sized piece of banana into a fine paste. Then add 1/2 tablespoon of honey, 1 tablespoon of oats, and 1/2 tablespoon of your favorite carrier oil. Apply the mask to clean skin, and allow it to sit for up to an hour. Gently wipe the mask away, and rinse–but don’t scrub–your face. Check out our other favorite DIY face masks here.